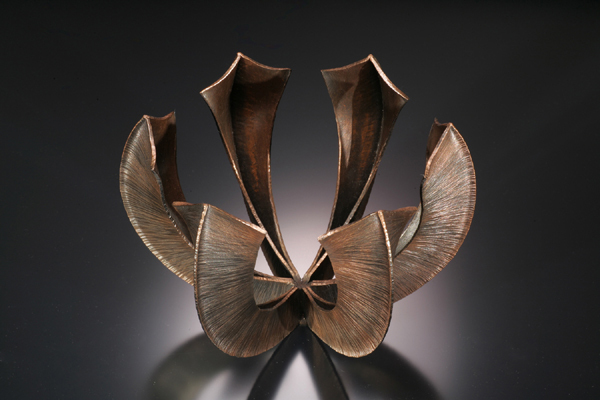 FOLD FORMING WORKSHOP – THE ART LEAGUE SCHOOL OF ALEXANDRIA. 14 jewelry students attended this successful studio based workshop, spending the first day working with paper & copper models, evolving into the production of a Heisted cup & it’s derivitives – followed by diving into a ring made from 24g copper using a three line fold format. Students were encouraged to play with the idea of making marks/folds into the metal; then re-forming it around a ring mandrel to see how the form expanded and stretched. Day two started out with a marathon fold forming demonstration covering T-folds; taperd folds; the Reuger fold & it’s close families and the use of hammers/rolling mills & the hydralic press to really stretch (OW!) the imagination. Students spent the rest of the day exploring the endless possibilities of this forming technique. No cuts were reported, but a few bruised fingers were noticed – a good day in my book. Please leave any comments you would like to share about this workshop. 9 jewelry students from as far away as Gettysburg & Manassas attended this successful studio based workshop, spending the first day working with simple line and T-fold copper models which were then torch fired enameled which allowed students a quick and immediate insight as to how the two processes work well together. Day one – Students were encouraged to play with the idea of making marks/folds into the metal to discover how the enamel colors; both opaque and transparent work with the highs and lows of the fold forms, and how the kiln temperature and the length of time the piece stays in the kiln affects the final outcome. Day two – Abby explored more in-depth enamel techniques, which opened students palette up to using foils; cloisonné wire; silver shot; eutectic silver as well as bronze wire mesh to both fold; form and enamel. Students developed more skills with the basic forming techniques, as well as explore some interesting ideas and forms of their own. Day three – On a rainy – followed by snowy Sunday – Students returned!!!! What hero’s and dedicated folks these are – people like this make teaching workshops at the Art League school fun and rewarding. Students explored more hammer forging and forming techniques to finalize some pieces and to develop new ones. Abby’s extensive knowledge of the enamels color palette helped students to develop some cool looking pieces, and avoided the dreaded brown enamel. Soldering findings and the making of pin mechanisms allowed students to see the wearability of some of the pieces they made in class. Thanks to the kindness of our students helping in clearing up the studio at day’s end, Abby and I were able to get home before the snow fall became a problem – Cheers! Please leave any comments you would like to share about this workshop. This workshop explored how the use of hand files, saws, and gravers, as well as flex shaft accessories can create infinite variety of form and decorative carved finishes for small-scale jewelry. 8 very enthusiastic students met this cool Spring day to carve & grind & saw & mutilate in a very creative way, a variety of pre-made brass sampler rings – this allowed them to work very fast on playing with the techniques they were shown, and explore the possibilities of the tools on hand. Once these aspects were taken in, they were ready for the challenge of carving a billet of Reactive Metals ARGENTIUM/COPPER Mokume Gane. Carving this beautiful material is a challenge to many, as the pattern formation stays a little mysterious right up until the billet is rolled and evened out. A little Baldwins patina then exposes the true beauty of the carvings. Again, a great workshop starts & ends with some willing to learn, eager students – thanks for making the first class a success! This was a great workshop. Nick did an excellent job making sure all participants grasped the foldforming concepts, which is quite remarkable with that many students. The workshop was a fabulous way to explore & play with foldforming. 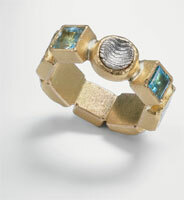 I’m looking forward to incorporating a number of the techniques I learned into both my sculpture and my jewelry. This was a great workshop i was waiting for to expand my skills. Besides i love the studio / class in which it took place and the free access we have to all the tools. Nick paid attention individually to all of us, although the class was quite popular. I was able to do the forms i was most interested in. Seeing the samples and possibilities obtained with the form folding techniques we were taught was very useful. Later on i may post few pics of things i almost completed in class. Thanks Nick, the workshop was a wonderful way to spend my weekend. Can i suggest a workshop in which you will incorporate torch enameling of some of the pieces we will do in class? Nick is a great teacher. When I walked into the class and saw how full it was, I thought that was not a good sign. Being quiet and introverted, I can be easily overlooked in a crowd. But that was not the case in this class. Nick gave great demonstrations and was able to give each student some individual attention. And he did this without ever seeming harried or impatient. I am already making Christmas ornaments to give to my family and I plan on making jewelry using the new techniques I learned from Nick. I look forward to taking another workshop with Nick. Thanks for a great experience. 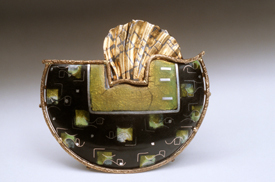 I thought Nick Barnes and Abby Goldblatt’s fold forming and enameling workshop was terrific. Nine students seemed a perfect number. Everyone had plenty of work space and time at the torch and kilns. The number and pace of the demonstrations worked very well.They imparted plenty of information but also left plenty of time to work on the demonstrated techniques. Each demonstration built on the previous ones nicely. Both Nick and Abby circulated to all students and gave each plenty of attention.They also were willing to teach special techniques to whoever requested them. I would absolutely recommend this workshop. I agreed with everything Penny said. I don’t think this workshop could have been any better. Nick and Abby are both very knowledgeable and were very accessible to all the students. I would recommend this workshop. This was a super workshop. The number of students worked great. 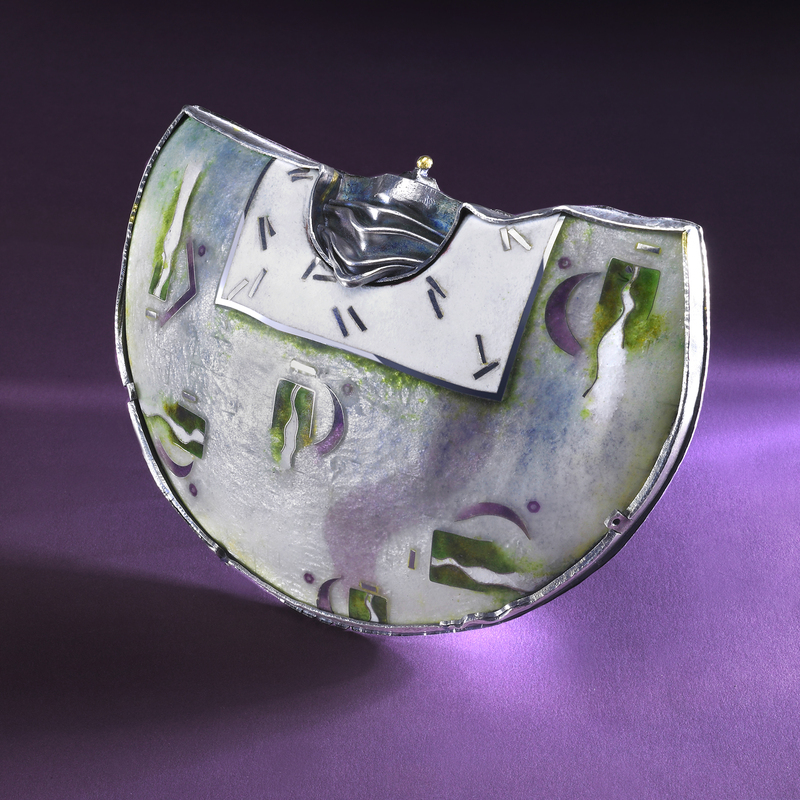 The combination of fold forming and enameling was wonderful. I really enjoyed having the opportunity to experiment with both techniques, seeing how far I could take concepts. Nick & Abby were excellent at their demos and at circulating around the class to work with all the students. I suspect I’ll take the workshop again because it was so fun and it was great getting ideas from the other students. The metal carving workshop was excellent. The smaller classes enable all the students to get focused attention from the instructor and to ensure that everyone grasped the concepts and techniques taught. I’m looking forward to continuing my carving exploration at home. Nick’s instruction, as always, was patient and in depth. Loved the metal carving workshop! Nick adroitly engages students at all levels, inspiring them to explore their own creativity while they are actively practicing new techniques. The various approaches and concepts were clearly explained and demonstrated, and I am looking forward to spending more time practicing the various metal carving approaches I learned. I had a lot of fun!